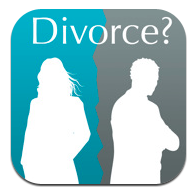 If I mention that iPhone and iPad now have access to a divorce app, you’d be forgiven for thinking that the world has gone mad and it’s now possible to divorce via text message or tweet. Fortunately, that’s not the case. Divorce? is designed to save individuals hundreds of pounds in legal fees, having been developed by one of the UK’s leading family lawyers, Peter Martin, head of family law at OGR Stock Denton. the sensitive issues around handling any children involved. With an opening section aimed at those in the early stages of considering their options, it could also help people avoid divorce entirely, saving their finances, heartache and marriage. Reflecting the new move for divorcing couples to be referred for mediation prior to going to court, Divorce? promotes the use of mediation throughout the process and explains how it can work and how to get the best out of mediating. The app costs £9.99 and is available from the Apple iTunes store. It’s true, i think it’s good to give yourself a break. Sometimes we get very used to our spouses that we no longer have any feeling for them. Sometimes it works even better when you stay away from one another for a while.